If you want be taken seriously and look professional, the wardrobe you choose plays a huge role particularly in a corporate setting. Dressed in a sharp, stylish suit can enhance your overall image and boost your confidence on the job. 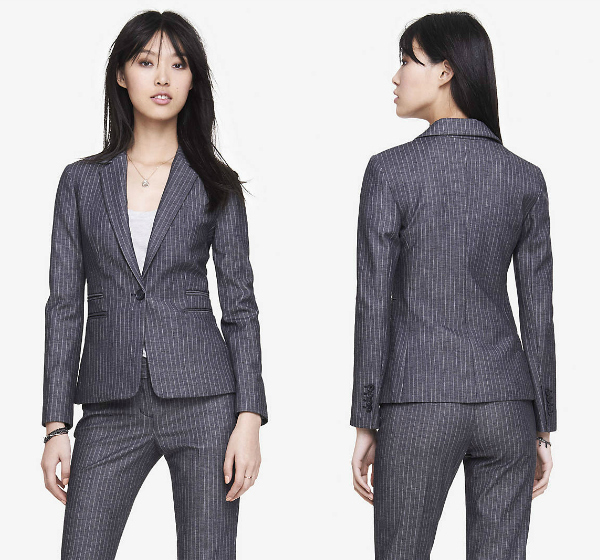 This striped suit ~ jacket & pants ~ from Express is a great choice for that matter. It’s such a flattering suit featuring a contemporary silhouette that is both sophisticated and edgy. I find the ‘navy + gray’ color combo absolutely chic. The best part is you can get this suit set for around $200! Wear the jacket and pants separately to complement your other work basics. The fitted jacket will make a great addition for smart-casual ensembles as well when paired with a pullover shirt and boot cut jeans for example.